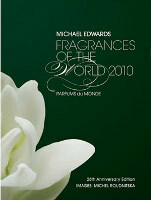 Author Michael Edwards will release the 2010 edition of his yearly Fragrances of the World, known as “the fragrance bible”, in January. The 26th edition lists over 7000 fragrances (around 800 more than the 2009 edition) classified by fragrance family. It is used by numerous retailers to help customers find fragrances they might like based on the scent(s) they already know and enjoy. See also: review of Michael Edwards' Perfume Legends. Ay chihuahua! Even at 10% off, that’s still out of my range! Shame, since this really interests me. They are not cheap. You can sometimes find old editions on eBay. I can barely stand to write it, it sounds so heretical to my own ears, but it almost seems odd to see a big reference book like this in (expensive!) hard copy instead of available as a database. So true…but you know it’s also available in an online database, right? It just costs a lot more. And has more information…the book is really just lists of fragrances under different fragrance families. Yes, there is an online database. The other year I stumbled across it by accident looking for the Micheal Edwards fragrance finder site… and I saw that it is very expensive. I would die to add this to my library’s database collection though!! i created my own database after discovering this site, to catalog everything i sample. Its simple, but it keeps track of the name of the fragrance, brand, family, notes list, my personal rating, best price info and where to buy, graphic of the bottle, etc. Yes, many of us do that! Thanks a lot in advance ,Lorena. It is not something you’d read…it’s a bunch of lists. It’s terribly helpful if you need to know what fragrance family a perfume is in, otherwise, it’s not. If you want something to read, do try Michael Edwards Perfume Legends. Thank you Robin,I’ll check it out. Ouch. Do I even want to know how much database access costs? I can’t remember, but over $1000 I think. More than I have, at any rate! Is it worth to get an example of the Michael Edwards parfums de légende? I have seen it on Amazon for Eur 38. Don’t know whether that is a good price. The French version would be not the problem. Thanks. Yes, that’s a wonderful book…absolutely worth every penny. Thanks, I ordered one. This blog ruins me…. Dear Robin, Thank you very much for your advice. It is a wonderful book. Good, glad you like it! Seems like he’s pricing it for the business world, not for real people–so it’s not really a book, but a “business tool”. I’d say that’s accurate: it’s not really aimed at general consumers.